The countdown has started and in two weeks time I will be heading to The Handmade Fair at Hampton Court Palace. 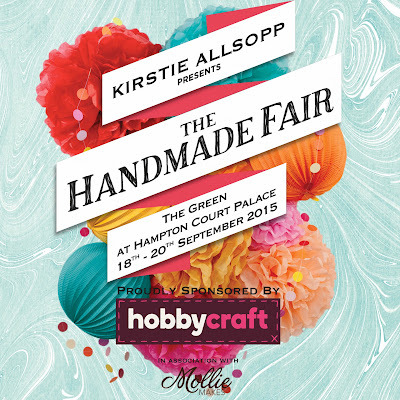 For a second year Kirstie Allsopp and the Handmade Team have created a three day event bringing together designers and artisans, to teach and sell craft products in a stunning location. I love the idea of attending a huge crafting event that isn't just about shopping, the focus is about learning, trying new crafts during hands-on sessions and meeting the people behind the best of handmade. Take a look at this lovely video showing highlights from The Handmade Fair in 2014, watching this I get a giddy with excitement. For me The Handmade Fair feels like a crafters dream event and I'm really excited to be going and being surrounded by others who share my handmade passion. I'm heading over on the Saturday and have selected the Full Experience ticket, giving me the chance to attend the three interactive craft areas, the Super Theatre, a Skills Workshop and a Grand Makes session, as well as having access to delicious food and the boutique shopping village. When you book your Full Experience ticket you get to choose from a huge variety of sessions to attend. There's such a wide mix of options to choose from it has taken me a little time to decide which sessions to go to! The Super Theatre is hosted by Kirstie and is a space where she will be bringing together all the talented people she has worked with over the years. Each Super Theatre session demonstrates a particular technique, as well as covering Q and As, hearing about the latest craft trends and expert tips. I'm really looking forward to attending the Mollie Makes Mash up with Jamie 'Mr X Stitch' Chalmers vs Lisa Comfort. It's a going to be a really exciting session seeing the combination of incredible contemporary and vintage craft styles, and real stitching talents, battling it out. I can't wait to hear Lisa's tips and techniques for sewing projects and seeing how they both transform a plain tote bag into a wearable piece! The Skills Workshops are the opportunity to learn a new skill or perfect one you already have tried and love. There are a huge range of sessions to choose from including fashion accessories, paper crafting, seasonal themed makes, upcycling with Annie Sloan, yarn and textiles, and wedding crafts with Hobby Craft. I've selected the Intermediate Knitting session with Suzie Johnson to make a wrist accessory. I'm really looking forward to this, having just picked up my knitting needles again after a long break I'm hoping that this session will kick start the knitting bug in me once more. With the majority of the skills workshops you get to take away what you have made which is such a great idea and a souvenir of the day. The Grand Makes tent is a chance to see how in a few minutes you can craft something that you can use in your home, at a party or as a gift. I've selected the Tibetan Poetry Bunting by Big Beautiful Bunting, where I'll learn to print poetry onto a cotton flag, embellish it and then tie it together to create one grand line of bunting! I've never printed onto fabric before and thought it would be a really quirky session to try. Alongside the sessions there is a boutique shopping village with a huge range of craft supplies and handmade items to buy, the Artisan Marketplace to shop homegrown foods, and lots of options of delicious food and drink to keep the energy levels up during the day. I'm hoping to pick up a few gifts for friends and family whilst shopping and buy some special unique crafty supplies for myself. I will have to set myself a budget as I think the array of shopping options is going to be very tempting! Going to an event like this should be something you share with a fellow crafter. I'm taking my Mum out for the day, we've never been to anything like this together so I'm really looking forward to it. My Mum first introduced me to and got me excited about making when I was young (take a look at one of my early blog posts to find out about my crafty beginnings) and I can't wait to share the whole experience with her. It will be an extravaganza of learning, crafting, shopping, delicious food and of course cake! I will let you know all about how I get on later this month.